A couple of months ago, I had way too much time on my hands, a stomach full of Mexican omelet, and a full tank of fuel. Central NJ, where I happen to live, has a lot of car dealerships within a 20 mile radius, but the selection can be a bit thin for some reason. 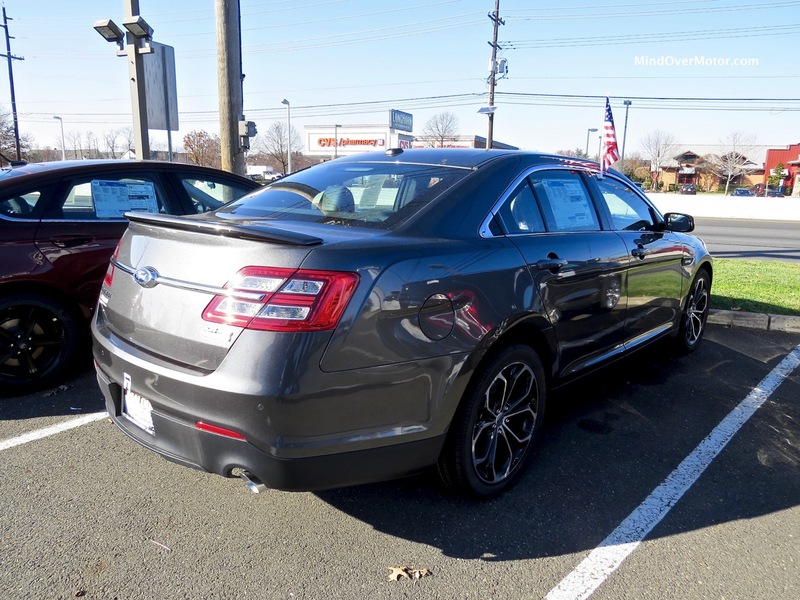 Luckily, I had a fifty dollar gift card to redeem from Ford for the LA Auto Show, and a local dealer down the street had a new Taurus SHO in stock. Then, my buddy Chris, who was accompanying me around town (and was my taller stand-in for interior room, for once), suggested I find something to compare it to. Not wanting to haul myself to the local Dodge dealers, we then descended on one of the local Chevrolet dealers, where a lightly used SS was sitting out front. I drove them both–and the results turned into a bare-fisted, old fashioned American street fight. May the best flag-flying American machine win. The Taurus will be the first victim to discuss. Suffice it to say, when the Taurus got a facelift back in the ripe old days of 2010, it was suspiciously similar in its lines to the 2000-2005 model, which was everywhere. So, it’s fair to call it a jellybean. Luckily, the SHO does a strong job of making the shape appealing, thanks to the machined accents and more-defined front bumper. The badging is subtle, just like the original–but unlike the original, I can’t really say I like the changes all that much. 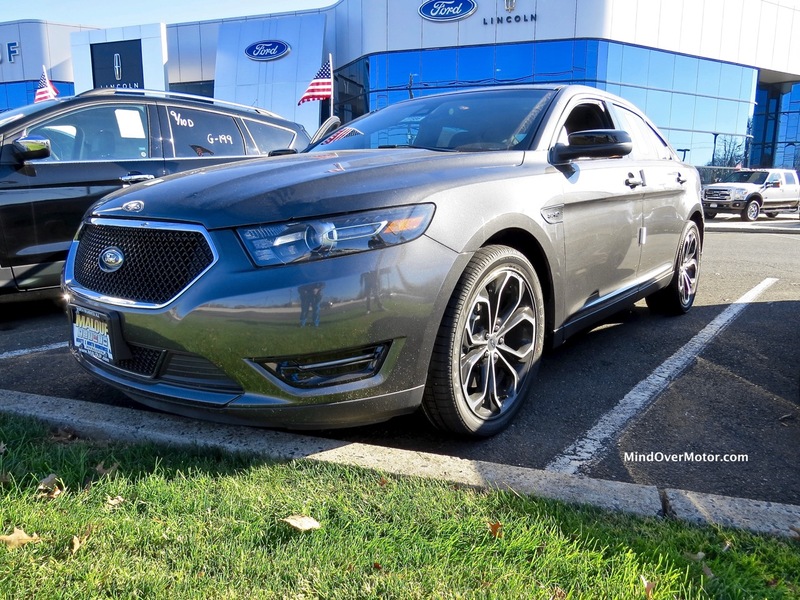 Considering that Ford facelifted the Taurus a few years ago to make it look more aggressive, they unfortunately took a bit of the edge off the SHO. The back looks much better than the front–the classic late Sixties taillights are old-school full size Ford and were incorporated well. I still can’t get over the jellybean shape, though. The Ford’s interior isn’t bad, but it’s a little milquetoast. The center stack is full touch-screen with buttons for the trunk and the multifunction panel, as well as an engine start, but everything is easy to look at. The steering wheel looks distinctly pedestrian, and the paddle shifters don’t really feel all that substantial. For such a large car, the space efficiency in the interior is visually a bit jarring too–the seats are massive but don’t offer support for taller individuals and the rear of the interior looks too constrictive. I sat behind Chris (who is 6-5) and for a full-size car, I felt that claustrophobia started to set in after 10 minutes. Ford needs to fix this interior before the next redesign, and although this is an older chassis (this dates from my days at Randolph High School so many years ago), it has not aged like a fine Bordeaux. It’s aged like Coca-Cola. The Chevrolet is a different flavor, and fresh too. 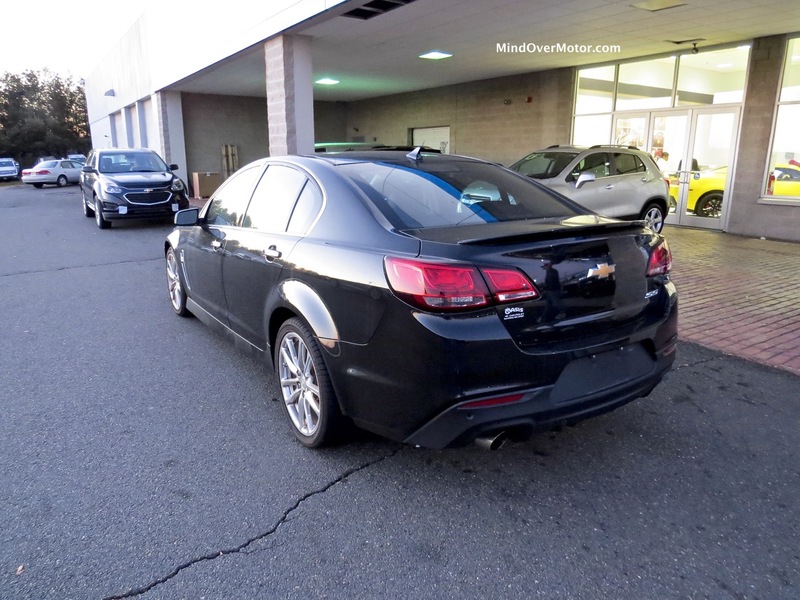 It bears a resemblance to the Malibu from 2013 and the Pontiac G8, which shares its platform, not a bad thing (if a bit anonymous). The shape is typical sedan but the shoulders are more muscular than that of the Ford. The front end is a bit bulbous but the rear, which sits a little higher, gives the distinct feeling of a performance car. I can say the same for the SS as I did for the SHO in that it is a bit anonymous, but unlike the SHO, the SS has a performance-oriented stance to it and an appearance that does not come off as a jellybean. The interior of the SS is far superior to the SHO. 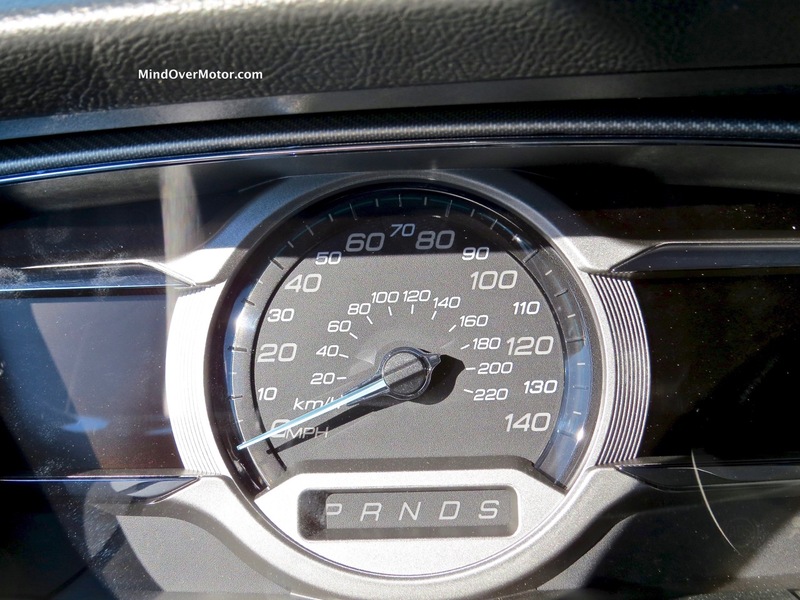 The gauges are all analog and unlike the SHO, a tachometer is actually present. The steering wheel and paddle shifters are well-designed, with a large flat bottom and solid paddles that have some weight to them. 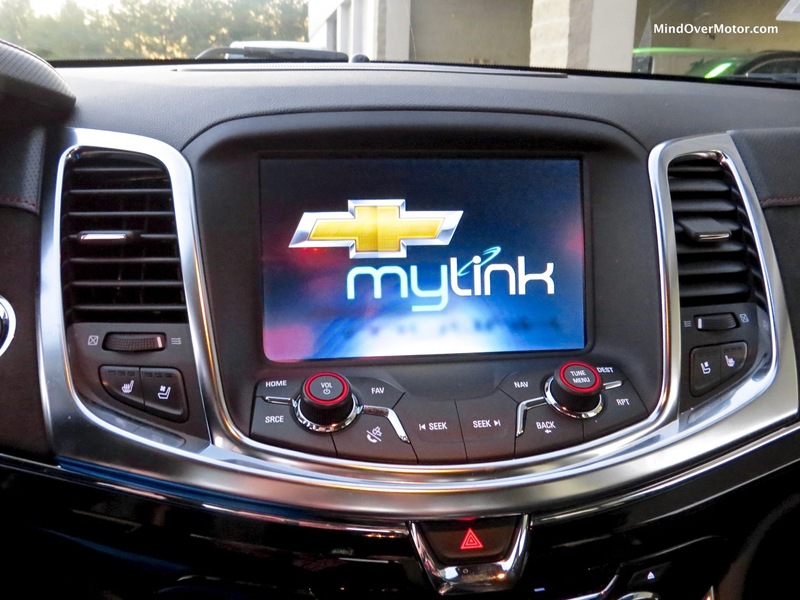 The center stack on the Chevrolet integrates more buttons to the touch screen directly above and still includes divorced controls for the HVAC and radio–a good touch for those of us who appreciate tactile surfaces. The seats are also better than that of the Ford’s, with more support and nicer material. It’s no BMW, and for 50 grand, it could be a little bit better, but for a Chevy, it’s not at all so bad. Again, I will start with the Ford. The Taurus, like the other products in the Ford stable, has been improving in its build quality from the last few years or so. The exterior build quality is quite good, but since this is again an older design, there are a few lines and parts that could use improvement. The chrome is almost a bit out of place on this model–it shines nicely but matte trim on the grille and rear end would be a bit better at hiding this car’s heft. 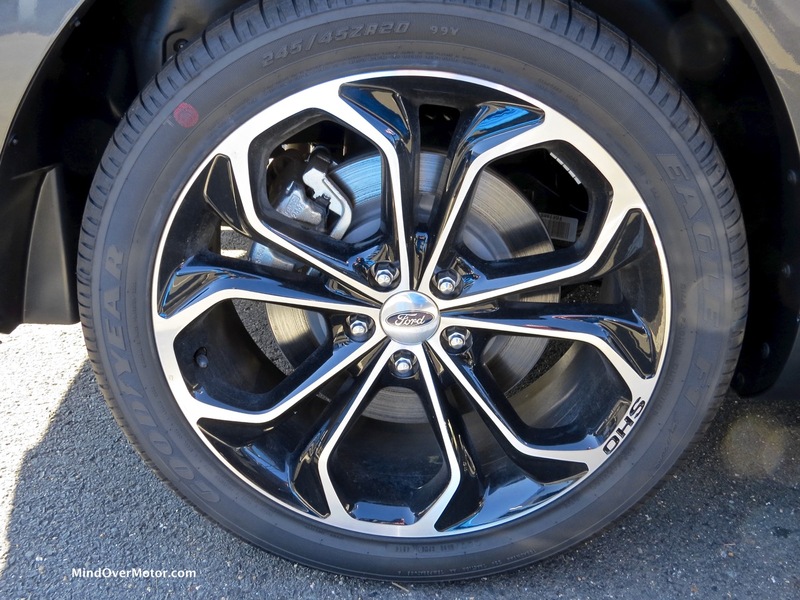 The rims look much better than they did when the SHO came out in 2010 or so–the dark chrome wheels are one of the best features I’ve seen on a high-performance Ford in a while. Unfortunately the plastic scallop ahead of the front doors lets it down a bit–for 40 grand, it looks cheap. A metal finish would pick that up nicely. 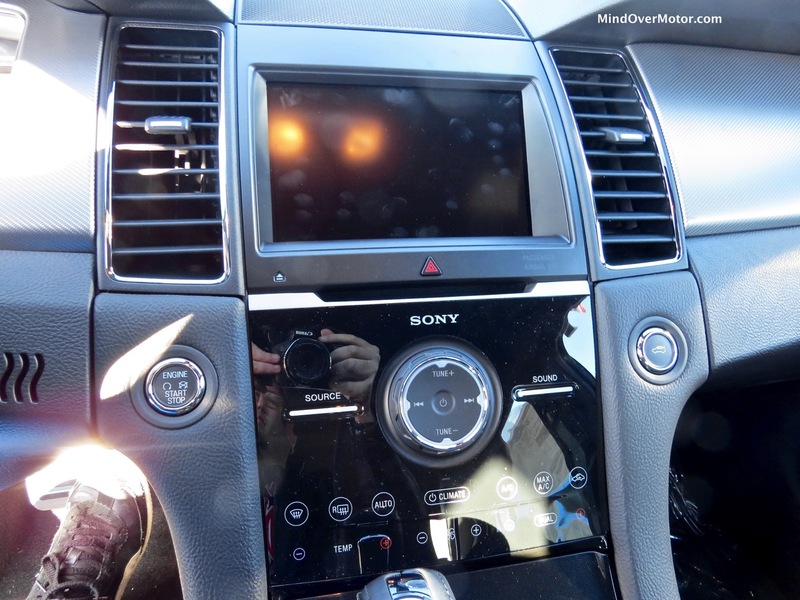 The interior quality isn’t terrible (better than most) but panel fit and finish is not that great–lots of gaps are present on the dashboard, which in this day and age, and at this price point, isn’t helpful. Visibility is good, except for over-the-shoulder visibility, which is hampered by a C-pillar that is too large. The Chevrolet is built quite well on the outside, the body lines are excellent and there’s no issues with paint quality. The only big downside is the body kit underneath the bumper and doors, which, despite being the same color, doesn’t appear that way. Unlike the Ford, the wheels look as if they will be difficult to clean–the bright finish is eye catching but will be easily smothered in brake dust within hours of hard driving, whereas the darker finish on the Ford’s rims may hide it a little bit more effectively. The interior is far better than the Ford, with soft-touch materials on the dashbaord instead of hard plastics. The finish is far more acceptable at the given price, with no gaps or rattles. All of the touch surfaces on the buttons is of a high quality as well. The only major interior issue lies with the typical chintzy GM gray headliner–this is one thing GM should get rid of on the SS’s interior, it doesn’t help things much. These two cars are completely different in their choice of layout and powertrain. The Ford is arguably a lot more modern, packing AWD and a transverse-mounted, twin turbocharged V6. The EcoBoost plant puts out 365HP, which is more than enough, but at almost 4400 pounds, the Ford needs a diet. Off the line, the SHO launches hard and charges up to speed aggressively, punching out a smooth exhaust note in the process. 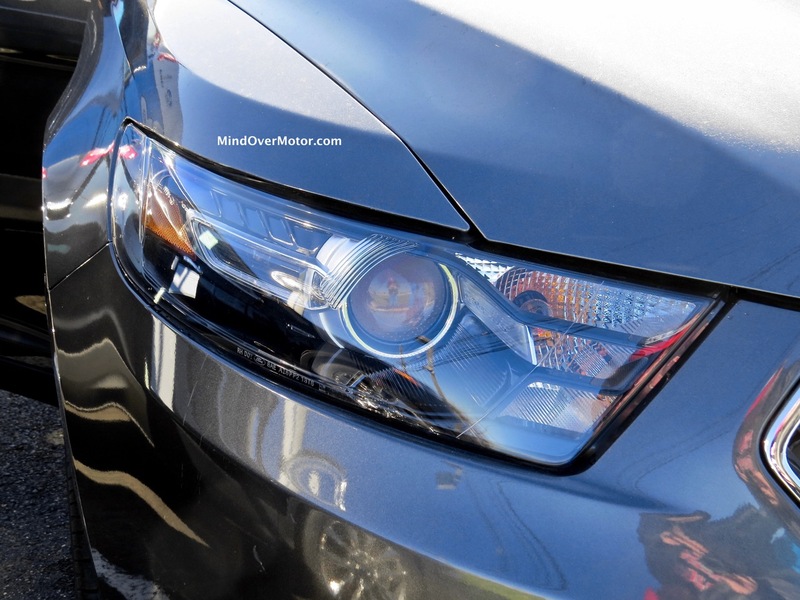 The six-speed automatic behaves well too, and doesn’t get too intrusive. Shifting manually is a non-issue as the transmission will hold gears all the way to redline. However, the steering is a bit lifeless and the ride quality is good until anyone finds a railroad line nearby, in which case a trip to the chiropractor will be in order. The brakes are very strong, with no fade and little nosedive. 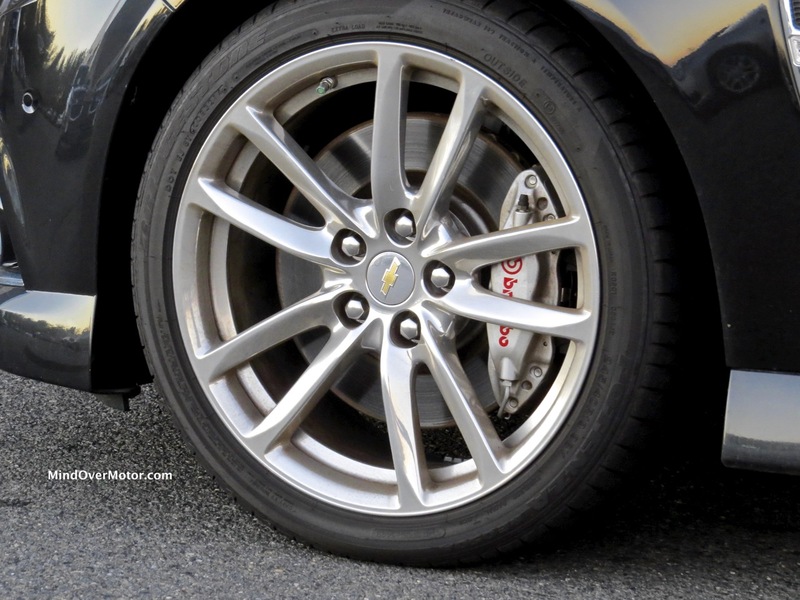 Handling is otherwise good, and the Goodyear Eagle F-1 tires grip excellently with low noise levels. The Chevrolet, being a RWD/V8-powered hot rod, is a totally different animal. The LS3 under the hood packs 415 HP and the SS weighs only about 4000 pounds, so it definitely gets off the line faster than the Ford. Chirping the tires out of the lot, I had plenty of control up to almost 100MPH. 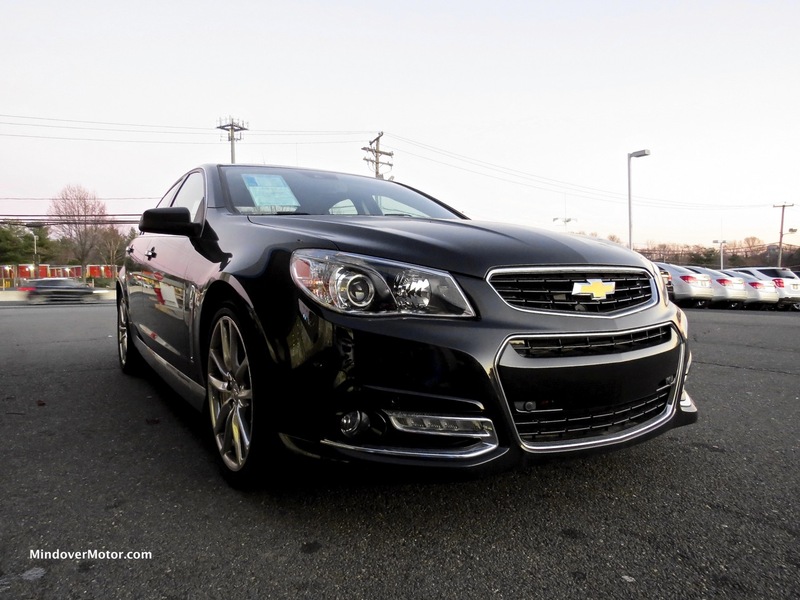 At wide-open throttle, the SS sounds like a legitimate muscle car. Punt it around corners and the tires hold on great, and it definitely feels more controlled than the SHO as well. It is, however, louder at speed than the SHO. The brakes are better than the SHO and the transmission, a six-speed automatic in this particular car (a manual is an option) is well-tailored to the LS3. Steering is much stronger than the Ford and has plenty of feel and feedback. 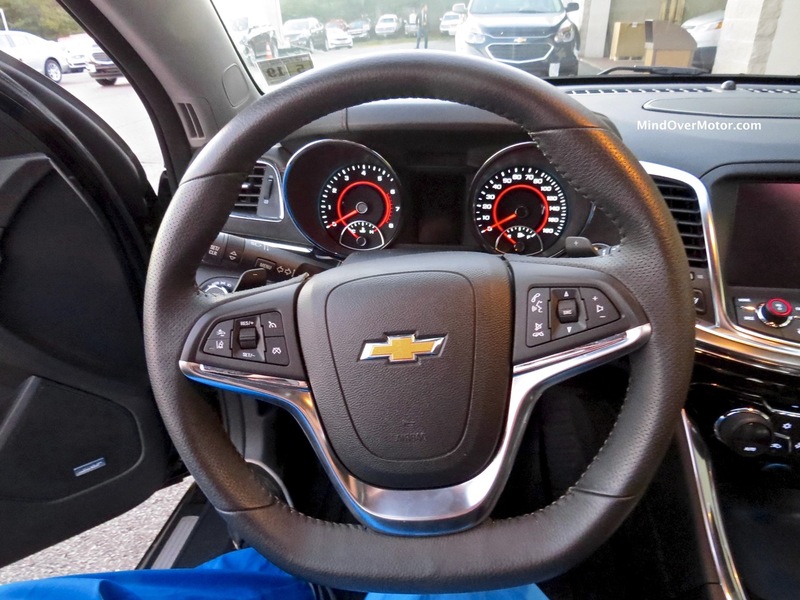 The heads-up display, combined with the excellent analog instruments, helps the Chevrolet feel like much more of a performance sedan than the Ford. With the scores the way they are, it’s not even a question the Chevrolet is the victorious party in this comparison. However, the prices reveal plenty more info. The SS is available only as a fully-loaded model, and in that guise, will cost almost $50,000 brand-new. Used ones can be had in the high-30K or low 40K range, close to a new SHO. 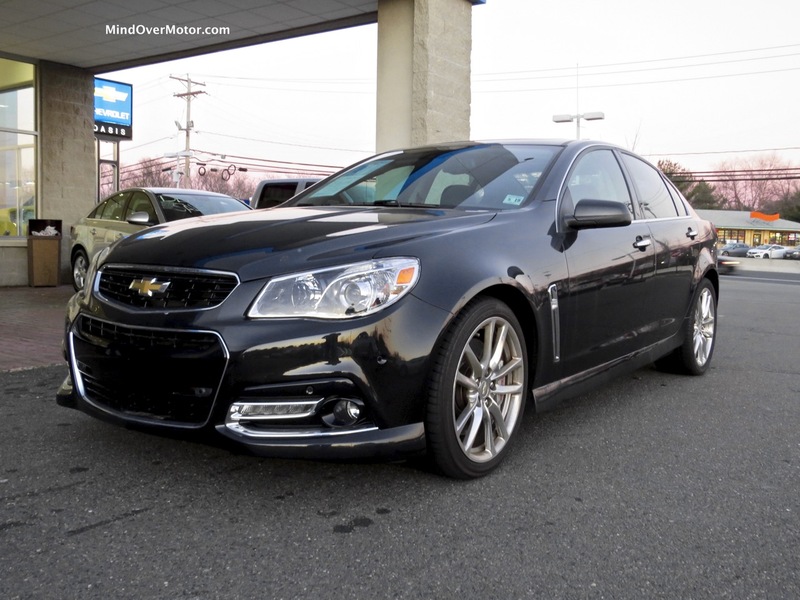 The SS has more room inside despite initial appearances, and even with a sunroof, a 6-5 individual will still fit inside with me in the back seat (a good family car scenario). The Ford also suffers in resale value, as used SHOs from 2013 and up can be had in the high-20 range. 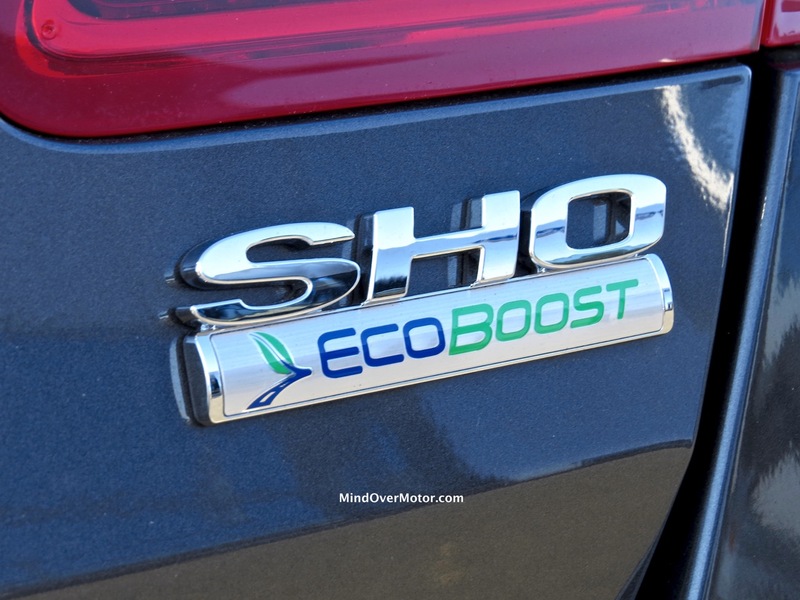 The SHO will have better gas mileage, plus the important ability to go in the snow, but it doesn’t match the street cred, exhaust note, or raw performance of the Chevrolet. Personally, I like the SS better, but the Ford’s practicality as a daily driver year-round is compelling for those of us who need it. Myself, I would rather just buy the SS and call in sick on snow days (or sell my video games and buy snow tires). Also, with the Ford’s lack of room for larger drivers, I think the Chevrolet is overall a better buy long-term. A canned tune from a well know brand that can be converted back to stock in 10 min adds 70 H.P. and 70 ft lbs tq. That is for the SHO of course.